The 2019 Ford Edge ST is coming soon, along with the rest of the Edge lineup. 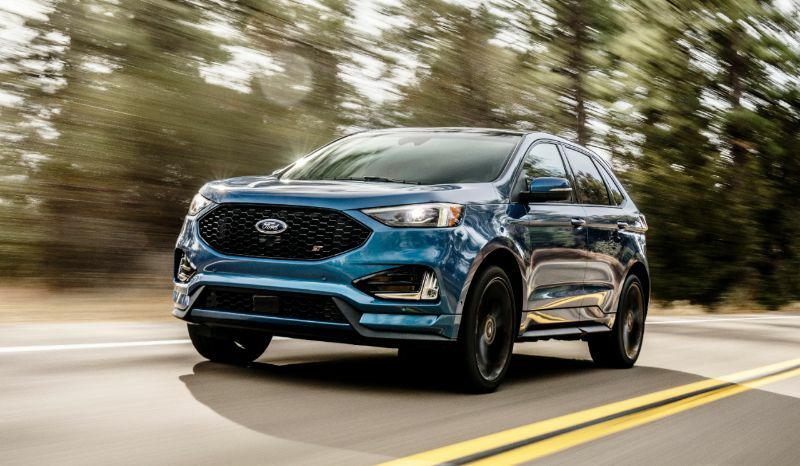 While drivers are looking forward to all 2019 Edge models, the Edge ST has been getting the most attention since its unveiling as a performance crossover in January. The ST takes the regular Ford Edge and gives it upgrades for both performance and appearance. This supplements the facelift that the entire 2019 Ford Edge lineup gets. The 2019 Edge ST will run on an EcoBoost 2.7-liter twin-turbocharged V6 engine. This engine puts drivers in control of 380 pound-feet of torque plus 335 horsepower. This is a boost of 30 pound-feet and 20 horsepower over the 2018 Edge Sport. In addition to the upgraded engine, the Ford Edge ST also has a range of mechanical upgrades compared to other 2019 Edge models. These include a sport-tuned suspension, all-wheel drive, and the sport mode. It always uses an 8-speed automatic transmission. In terms of aesthetics, the Ford Edge ST has a very large grille that is similar to that of the Fiesta and Focus ST. It also has a dual exhaust and special 20-inch wheels. Inside, it features sporty seats and standard leather trim to enhance the luxury feel. You also get paddle shifters for complete control of the driving experience via the automatic transmission. Ford only just announced the pricing for the 2019 Ford Edge ST. It will start at $43,350, which already includes the destination charge. Compared to the 2018 Ford Edge Sport it replaces, this is an increase of $1,585. There are also many ways to increase the price of the Edge ST via various packages and options. While this is definitely more than the average person expects to pay for an auto from Ford, experts agree that it is a fair price for what you get. It is still about $10,000 less than an Audi SQ5 with similar equipment, giving those who want a sporty and luxurious crossover an option that is not from an expensive luxury brand. 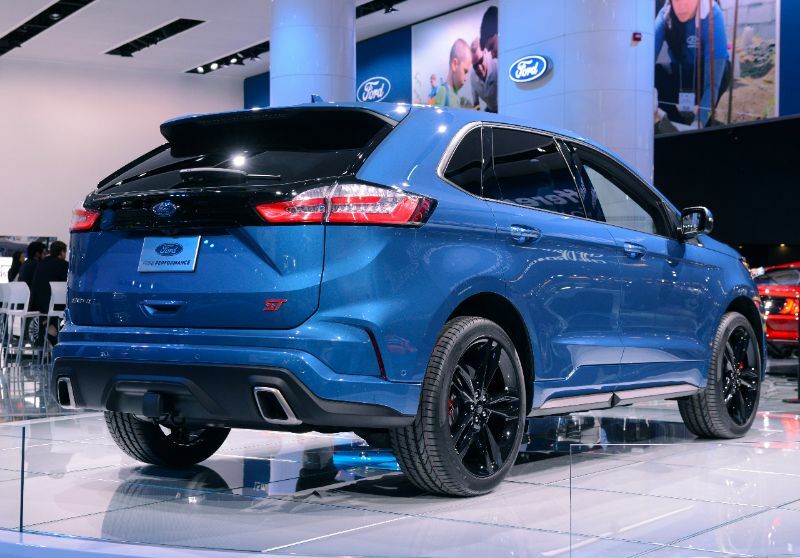 Those who want to make their 2019 Ford Edge ST more exciting can add Equipment Group 401A. This includes heated and cooled seats in front, navigation, a panoramic sunroof, a hands-free power liftgate, enhanced park assist, and safety tech via Co-Pilot360 Assist+. There is also a Performance Brake Package that unsurprisingly adds performance brakes in addition to summer tires and 21-inch gloss black wheels. That Ford Co-Pilot360 Assist+ feature is worth more detail, as it supplements Ford’s Co-Pilot360. That’s a big step for the automotive industry. 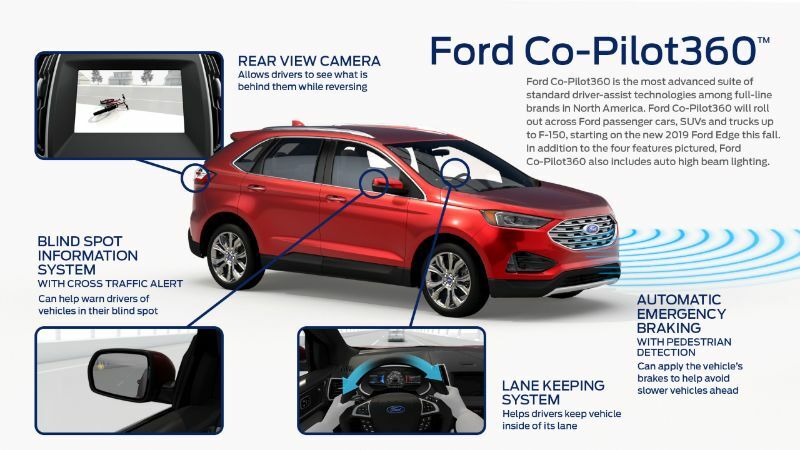 This suite delivers standard driver-assistive technologies like cross-traffic alert, a rearview camera, auto high-beam headlamps, a lane-keeping system, a blind spot information system, and automatic emergency braking featuring pedestrian detection. The 2019 Ford Edge ST is not yet available. However, it will be hitting dealerships later this summer. As the release date gets closer, expect expert reviews from those who get a chance to take it on a test drive ahead of its release. Based on the information already available, we expect it to be a fun yet practical vehicle.